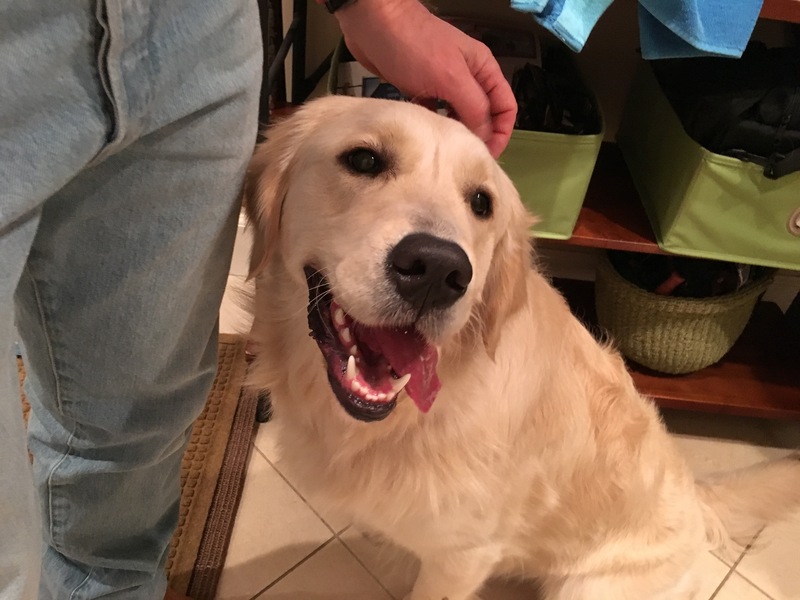 Hobie is a two-year-old, English Cream Golden Retriever who has been getting progressively more mouthy and defiant with his guardians; barking and nipping at them when they disagree with his behavior or try to correct him. As soon as I met him in person, I knew that Hobie was going to be a challenge. He was overexcited at the door which is fairly normal, but even after being corrected multiple times he continued to try to jump up on me or nudge me with his nose to tell me to pet him. While it’s a natural instinct to hold a dog back when it is jumping up on or invading the personal space of a visitor, this technique can actually intensify the dog’s reaction. The dog is already over excited but when it’s restrained, it increases its energy output to try to defeat whatever it is that’s holding it back. This extra energy is often transferred to the dog’s reaction to the guest. Later on in the session I showed his guardians how to get in between the dog and anyone he was accosting and this is a technique that they should apply whatever guests arrive at their front door and the dog behaves this way. By inserting your self between the dog and whatever it’s excited about while keeping your hips and shoulders facing the dog, you can present a more authoritative posture that will get the dog’s attention. Once you have inserted yourself between the dog and whatever its reacting to, you need to move towards the dog and not allow it to run around or through you. Basically think of yourself as a hockey goalie and the dog as the ball. So if the dog moved your right, you move to the right to match it and keep it from getting past and so on. Keep marching directly at the dog until it is seven or more feet away from your guest or behind a natural boundary such as when the flooring changes from tile to wood. Once your dog is at this distance, take one step directly backwards while keeping your hips and shoulders squared up towards the dog. Pause after taking the step backward so that you can read and react to the dog. If it stays in place, you can take another step directly backwards towards your guest. It’s important during this process that you keep your hips and shoulders squarely facing the dog and that if at any point that the dog starts to move forward, you immediately disagree by rushing towards the dog until he gets back behind whatever boundary or border you have a established. You need to move suddenly and deliberately, almost to the extent that the dog flinches. With enough practice, the dog will learn to simply sit or stand behind this border and allow its guardians to answer the door while remaining calm. Once inside the living room, I sat down with Hobie and his guardians to discuss the situation and how I could best help them. Right away I noticed that the dog showed a little regard for the humans personal space, repeatedly nudging them when he wanted attention from them. Making matters worse, one of the guardians petted him as soon as he came near or when the dog nudged for attention. By asking the dog to sit, come or lay down before providing it with any attention or affection, his guardians will be able to condition Hobie to adopt these behaviors to ask for attention in the future. Right now the dog engages in whatever behaviors it feels are appropriate to get attention because his guardians provide it on demand. Because the guardians didn’t really have much structure in place for the dog and rewarded him this way, Hobie had become a bit of a spoiled dog. When he nudged them for attention and they didn’t respond, he started to get mischievous; nipping at their hands, pants or snatching an object that he wasn’t allowed to have – all in an attempt to get more attention. For dogs, good attention and bad attention from the guardians are nearly the same. To help his guardians better communicate that they disagreed with these unwanted behaviors, I went over a set of escalating consequences that I apply when a dog fails to listen to me when I disagree with it. These new nonverbal communication cues should be more quickly understood by the dog as they are given to him in his native tongue; body language. But almost as important as applying these new communication cues will be the timing at which they are deployed. When it comes to dog training or disagreeing with unwanted actions, timing is everything. Dogs go through life probing and waiting to be corrected or rewarded for their action. If we reward the dog to early or too late, it’s difficult for the dog to connect the reward with the action that we are agreeing with. The same principle applies when we are disagreeing with a dog. For example, if we don’t want the dog to walk onto the carpet and we consistently make a sound to disagree with it the instant it passes the threshold to the carpet, once enough corrections have happened the dog eventually puts together the boundary and the correction. This allows it to determine that the humans want it to stay off the carpet. But the reality is most people are not paying close enough consistent observation to their dogs to disagree at the right time. A good example is a dog who over-barks. Most people simply wait trying to show restraint and hoping that the dog will stop on his own. After several minutes of listening to a dog bark, the human finally reaches its limit and then rebukes the dog. While it’s nice to be patient and tolerant when dealing with other humans, when it comes to unwanted dog behavior, it’s best to speak up immediately. If we make the “no” sound or disagree the instant the dog starts to bark enough times, the dog eventually realizes that we are disagreeing with its barking. Whenever possible, disagreeing with the dog before it starts to engage in unwanted behavior is even more powerful. So the next time Hobie’s guardians notice that he is about to jump up on one of them, nip at their hands or nudge them for attention, if they’re able to make a sharp hissing sound like a cat to disagree before the dog starts, they will find that it is much more effective. I developed a leadership exercise a few years ago to help guardians practice saying no and then delivering the escalating consequences with good timing. The exercise involves placing a treat on the ground and then claiming it as another dog would. Usually a dog challenges for a moment or two but after being consistently blocked, it gives up and moves away. Not Hobie. He relentlessly barked, ran around, nudged and nipped at me in an attempt to get the treat that was on the floor. I was able to eventually complete the exercise, but it took far too long and didn’t have the desired results on the dog. Its supposed to help them calm down but in this case it made Hobie even more excited. One of the goals of the exercise is for the dog to understand that challenging the human doesn’t work and is no longer rewarded while surrendering or obeying has a benefit. But in this case, Hobie instantly recognize that he could use his athletic ability to his advantage to defeat the exercise. Fortunately Hobie’s guardians kennel him. We relocated to the room with his kennel so that I could show them a variation of this exercise that uses the kennel to block the dog from using his athletic ability. I tossed a few high value treats into the kennel and let him go in and get them then exit the kennel on his own. I did this several times until he went into the kennel without any hesitation. Once the dog showed that he was completely comfortable going into the kennel this way, I tossed in another treat and then silently followed behind him so that I was standing in the doorway to the kennel blocking his exit with my shins. When Hobie turned around and saw that I was blocking his exit he attempted to squeeze past my legs. I adjusted my position to block him from exiting and remained in position until he stopped his attempts to escape. The second that Hobie stopped, I immediately took one step directly backwards making sure to keep my hips and shoulders were squared facing the kennel’s door. Now that I was standing a few feet away from the kennel, Hobie we had another opportunity to exit. As soon as the dog started to move forward, I immediately made a hissing sound while simultaneously stepping directly back towards the kennel to block him from exiting. Hobie stopped as soon as I did this so I took another deliberate step backwards and then waited again. We continued this one step forward, one step back dance for about 10 minutes before Hobie understood I was communicating he was not to leave the kennel even though the door was open. When a dog does not want to be in the kennel, they often look at the kennel as an obstacle they need to overcome. This is why many dogs will scratch, chew on or bend a kennel to try to escape. I paused in between each step backwards so that I had an opportunity to read the dogs’ body language and respond if Hobie tried to move forward to exit the kennel. This exercise takes a lot of patience and precise timing in order to work. In the Hobie’s case it took nearly a half an hour for him to finally give up and lay down inside the kennel. As soon as he did this, I immediately dropped to a knee and gave him a recall command to communicate that he was now authorized to exit the kennel. Even though he had spent the last half an hour trying to get out of the kennel, now that I was giving him permission he was confused and remained inside. I had to do a little coaxing but eventually was able to get Hobie to understand I was giving him permission to exit the kennel. I spent a few minutes playing and interacting with Hobie to make sure that he was back to a normal, balanced frame of mind before we practiced again. This time I had one of Hobie’s guardians conduct the exercise so that I could coach him through it. Due to the length of time that it took for Hobie to complete these exercises, I do not have videos of them. However the second time he ran through the exercise he completed it in about 20 minutes or one third faster than he did the first time. It will be extremely important for Hobie’s guardians to continue to practice this exercise multiple times a day until the dog is able to lay down inside the kennel on his own in 30 seconds or less. When the dog starts laying down this quickly we know that he understands the exercise parameters and is ready to move to the next step. The next step involves increasing the amount of time that we ask Hobie to remain inside the kennel before we give him permission to exit. At first I start with one full minute. Once Hobie can consistently wait in a calm manner for 60 seconds, then his guardian can move to the next step which is two minutes. Once this is the case they will continue going by one minute increments all the way up to 15 minutes. Just like humans who develop a new skill set, the first step is to master the exercise in the easiest way possible. Once that level of expertise has been achieved, the next step is to gradually make it more challenging to develop the dog’s ability to do it better, or in Hobie’s case, longer. Not only will this exercise help Hobie learn to restrain himself and remain calm while inside the kennel, it will also help him develop more respect for the authority of his guardians. While structure and discipline is going to be a huge factor in Hobie’s rehabilitation, the elephant in the room is the dog’s unspent energy. Hobie is what I refer to as a high energy dog. Even though his guardians had been taking him out for daily walks, the way they were doing so was giving the dog the wrong impression. They were allowing Hobie to walk in front of them on a retractable leash. But when a dog is walking in a group, whoever is in front is the leader. As a result every time they walked the dog this way, they were unintentionally telling him that he was in the authority position. I pulled out a Martingale collar and showed his guardians how to add the special twist to the leash to stop him from pulling. I also went over how important it is to make sure that the dog is completely calm throughout the leashing process. Many people mistakenly continue to move forward despite the fact that the dog starts to get so excited that it has difficulty controlling itself. But most dogs get into the most trouble when they are in an over-excited state. Many dogs recognize that their guardian is about to take them for a walk based on the steps the guardian participates in while going through the leashing process. People often sit in a particular place, put on a specific pair of shoes, use a particular jacket or do other repeated actions like picking up poop bags from a specific cabinet. These are telltale signs to the dog that they are about to go for a walk. To stop the dog from reacting as soon as it recognize these pre-walking steps, the guardians need to stop as soon as they notice the dog starting to get excited. By stopping precisely the second the dog starts to get excited, then leaving the area and sitting down to wait for the dog to return to a completely calm state before returning, we can help the dog learn to adopt a more balanced and relaxed energy before going on walks. For most dogs the guardian will needs to practice the stopping technique 6 – 10 + times before the dog remains calm throughout the entire process. But the crucial aspect of this is to stop the instant the dog starts to get excited and to not allow the dog to get at all excited. The other important aspect is to remain sitting until the dog returns to a completely calm state. A common mistake that many people make is to wait for the dog to get almost calm, then starting too soon. Now that Hobie was in a calm and balance state wearing the Martingale collar, we were able to go outside so that I could coach his guardian through the structured walk that I wanted them to start using. In a structured walk, the dog remains on the right or left side depending on the guardian’s prerogative. This is the dog’s place in the formation and it should remain there no matter which direction the handler is moving. I only allow the dog to move as far ahead as the tip of my foot on my stride forward. Ideally you want to see the dog’s shoulder aligned with the handlers hip. I do not allow a dog to stop and sniff while on a structured walk. They can sniff as long as they remain in position and on pace with the handler. Any time at the dog gets out of position behind, I simply allow my arm to go completely relaxed while I continue moving forward. The Martingale with the special twist to the leash will defeat the dog’s attempt at stopping as soon as the line gets taught. The last rule I have on a structured walk is to not allow male dogs to mark territory. When a dog is walking with you and marking by lifting his leg on vertical surfaces, it is asserting itself in an authoritative way. The correction on a Martingale used in this manner is a quick jerk upward that is immediately followed by the relaxing of the arm to remove the tension from the leash. A dog will always pull against a tense leash, so the last thing you want to do is to try to pull the dog into position. As soon as the dog moves too far forward, the handler needs to immediately jerk the leash upward and then relax the line. This communicates the dog that it is starting to move out of position. At first the handler will need to apply corrections liberally. But if their timing is good, the amount of needed corrections should diminish rapidly. It only took a small number of corrections before Hobie started to walk with a loose leash next to his guardian. When we returned from the walk, I noticed that the home had a set of stairs that started right near the front door which gave me an idea for an exercise they can use. Instead of allowing Hobie to go free as soon as we came into the home, I showed the guardian how they could use this set of stairs to help the dog practice following their lead while on the leash. One mistake Hobie’s guardians had made was failing to get him properly socialized around other dogs when he was a puppy. This is almost surely the reason that he mouthes and nips so much at his current age. When a puppy is allowed to play and socialize with other puppies they quickly learn that being bitten doesn’t feel as good as it does to be the biter. As a result, this interaction usually curtails a dog’s attempts to mouth or bite others. I recommended that Hobie’s guardians enrolled him in doggy daycare and complete one or two weeks of taking him there for the full day every day of the week. By spending time with his own kind, Hobie will quickly learn that mouthing and nipping isn’t the proper way to interact with others. Additionally, spending time amongst a group of similar sized and energized dogs will help Hobie drain his unspent energy. This should result in a much more balanced and behaved dog when he returns to his home at the end of the day. I’m guessing that once Hobie has a constructive way to release his unspent energy through daycare, many of his unwanted behaviors and actions will dissipate quite quickly. A great maintenance exercise would be to take him outside for a quick game of fetch anytime he started to get rowdy inside the home. By immediately taking the dog outside and releasing his unspent energy in a constructive way with a fetch, his guardians can head off his mischievous behavior before it actually begins. Combined with the new nonverbal communication cues and escalating consequences, his guardians should be much better prepared to lead and disagree with Hobie when he engages in unwanted actions or behaviors. To help Hobie understand that following the instructions of his guardians is something that is rewarded, I showed them how to practice a simple recall exercise. Because the recall exercise utilizes positive reinforcement, while also asking the dog to place itself into us more subordinate position (sitting), the more his guardians practice this, the more responsive Hobie should become to their commands. Hobie is a project for sure. His guardians were most concerned with his nipping when they attempted to correct him thinking that it may be a sign of aggression. But in this case it was simply a dog that had been spoiled who had never learned the proper boundaries from other dogs when he was a pup. Now that his guardians know how to incorporate rules, boundaries and limits, they will be able to use the structure to mold the dog into more of a follower mindset. Combined with daily visits to the dog daycare facility, Hobie’s behavior should begin to improve dramatically. He was already calmer and responding to their lead and corrections with less pushback. His guardians will likely encounter a setback or two in the days that follow, but by remaining consistent and applying the escalating consequences with good timing and practicing the exercises that help the dog develop more self-control, Hobie’s days of acting like a spoiled dog will be at an end.